From Celtic Immortal to a New Kind of Vampire. – A Few Letters And Words. From Celtic Immortal to a New Kind of Vampire. 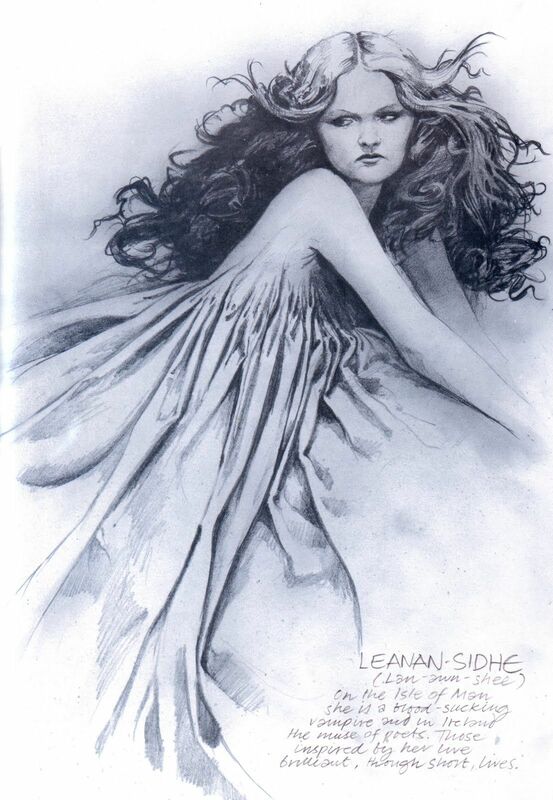 This mysterious, scolding, seductive figure you see is the Leanan-Sidhe, a celtic spirit, described by W.B Yeats as a muse of poets, who in exchange for inspiration to her chosen poet, would feed on their life force. Sound similar to another folkloric figure we all know so well? A vampire maybe? Funnily enough, Yeats himself described this fae spirit as ‘vampiric’. This image amazed, bewildered and dazzled me from a very young age and inevitably had an effect on me in later life. Back in 2015 I took a module at Uni on prose methods and forms. Part of this module included a section on short story writing. In one of the workshops for the module we were asked to write a piece of prose that could be the start of a short story from the narrative perspective of someone completely alien and different to ourselves. I decided to write a piece that had a narrative voice from beyond death, from a immortal. This piece then went on to form the basis and the first chapter of my dissertation. BUT, this post isn’t about my dissertation, if you did want to read more about it and about the process of writing it, I did a post on it which you can find here. So, where did the Irish folklore surrounding the Sidhe (like Leanan-Sidhe) and their predecessors, the Tuatha De Danann, come from? Were they all just stories, made up, modified and exaggerated upon to make sense of vastly different invading peoples? – The Tuatha De Danann arrived in Ireland in 1897 BC when Ireland was at that time ruled by the Fir Bolg. – The Tuatha De Danann were said to arrive in Connact on Ireland’s coast, shrouded in a mist. -They fought the Fir Bolg and lost but, the Tuatha De Danann were civilised peoples and allowed the Fir Bolg to stay out of respect for how well they fought. – The Tuatha De Danann ruled until 1700 BC before they were defeated by the Melesians (understood today as the people who went on to become the Celts) who, though allowed them to stay, forced the Tuatha De Danann people underground in fear of their power. Some extra info about this mysterious, powerful, intelligent peoples include: the rulers who first landed in Ireland all had their own magical talismans, they were all fare, red haired or blonde haired. Their true king, Nuada lost an arm in battle against the Fir Bolg and was taken from his throne, a Formorian (people originally from the Hebrides) took the throne, to the disdain of their people, only to be ousted 7 years later by Nuada who came back with a silver arm, pretty cool huh? Their history and myth is such a source of mystery that I am honestly SO surprised that no one has really used it as a basis for their writing before. Arguibly Tolkien’s race of Elves could be likened to the Tuatha De Danann but he apparently never cited them and instead used Norway’s mythology as inspiration. Speculation about their heritage runs from the reasonable: coming from Scandinavia, possibly Norway, to the outlandish: an alien/supernatural race of immortal people all with magical abilities. Another line of intrigue I followed when I was researching this specific chunk of time in Ireland’s past was the genetic history and geographical timeline of the red hair gene. This sounds really random and odd I know, but stick with me. Red hair is a bit of a genetic mystery, no one really knows when and where the gene appeared first. Some people have come to believe that the reason why red hair is so popular in Celtic countries such as Ireland and Scotland, is down to the mysterious race that this post is dedicated to: the Tuatha De Danann. The Celts/Melesians came from mainland europe an were of dark hair, sometimes dark skinned appearance, the Tuatha De Danann however as I have already mentioned were of pale, fare skin and red/blonde haired appearance. Is this the reason for this generally accepted idea of what a Celt looks like? If so, how can we ever really know where this red haired gene comes from? When we can never know where the holders of it came from? When you learn this you start to see why people have become a little bit crazy with their ideas about these peoples, aliens from outer space and all. So much has been explored, written on and delved into with many ancient cilivisations: the Ancient Egyptians, Ancient China, Rome, Vikings… And yet the BC history of Ireland has been completely overlooked. Part of me wants to keep the mythology that I loved so much as a child to myself. But I honestly think it deserves LOTR scale epicness . Why not? All the bases are there… We just need a writer to come along and turn it into a story. Previous Post The Process of Drafting Poetry.